Come to the Technical Museum in Brno. You can see here student work from industrial design (for example train seating, self-propelled harvester, electric motorcycles), through product design – home appliances, furniture, clothes, decorative design. And also a large group includes medical devices and equipment, such as a home-based device designed for children with attention-deficit/hyperactivity disorder or a cardio gamma camera, which in practice could shorten the patient’s examination from the original 20 minutes to 2-4 minutes. You can see the works of students from Tchaj-wan, Bosnia Herzegovina, Germany, Hungary, Romania, Poland, Sweden and Slovakia. Part of the DESIGN.S exhibition will also be an exhibition of diploma theses of the Industrial Design Department of the Faculty of Mechanical Engineering of the Brno University of Technology and the Design in movement exhibition or movement in design 2015 -2020. You can see both exhibitions in the Technical Museum in Brno at the same time as the DESIGN.S 2018. Committee of Experts DESIGN.S met on 9 April 2018. The final list of students, whose works were shortlisted can be found here on www.design-s.eu. Congrats! In this year’s International Biennale of Student Design DESIGN-S 2018 we received 400 entries from which 177 entries were shortlisted. It included 315 works by university students and 85 works by students of secondary schools. Furthermore, we received 51 entries from abroad – Poland, Bosnia Herzegovina, Romania, Germany, Great Britain, Sweden, Hungary and Taiwan. We are looking forward to seeing you on 25 June 2018 at the VERNISSAGE in TECHNICAL MUSEUM in BRNO. On this year’s International Biennale of Student Design DESIGN-S 2018 we received 400 entries at total. It was attended by 315 universities and 85 secondary schools, which is in comparison with the biennale 2016 four times more. Furthermore, we would like to mention that we have 51 entries from abroad – from Poland, Bosnia Herzegovina, Romania, Germany, Great Britain, Sweden, Hungary and Taiwan. Now the selected works are being processed and the results will be published on this web site on 20 April 2018. The Committee for 3rd Year of International Student Design Biennale – DESIGN.S will meet on 9 April 2018. The results will be announced on 20 April 2018 on www.design-s.eu. The closing date for application entries to the International Design Biennale of DESIGN.S has been postponed until 25 March 2018. Students and graduates of secondary or higher education in the field of industrial and product design may submit their works, whose work may not be older than three years from the end of their studies. Each student can submit up to 5 entries (1 application per job). Collectives may also be reported. For more information, please visit www.design-s.eu. The best work will be exhibited at the premises of the Technical Museum in Brno from 26 June 2018 to 16 September 2018. The winning works will be announced by a commission composed of experts at the opening on 25 June 2018. Students of secondary schools and colleges have the last chance to sign up for their work in the field of industrial and product design to the international design biennale DESIGN.S. Students and graduates may submit their work. Each student can submit up to 5 entries (1 application per job). Teams may also sign up. The deadline for the applications is 16 March 2018. For rules and application forms go on www.design-s.eu. For further questions, please write to info@design-s.eu. The best work will be exhibited at the premises of the Technical Museum in Brno from 26 June 2018 to 16 September 2018. The winning works will be announced by an expert jury at the opening on 25 June 2018. Students and graduates whose work must not be older than three years after graduation may submit their work. Each student can submit up to 5 applications (5 pieces of work). Teams can also submit their work provided more people are involved in one project. The deadline for acceptance of applications is 16 March 2018. The best work in the field of product and industrial design will be selected by the expert committee after the closing date for the applications. And they will be presented at an exhibition called Design.s 2018, which will take place from 26 June 2018 to 16. 9. 2018 at the Technical Museum in Brno (TMB). The winning work will be announced at the opening on June 25, 2018. Join in the 3rd International Student Design Biennial! 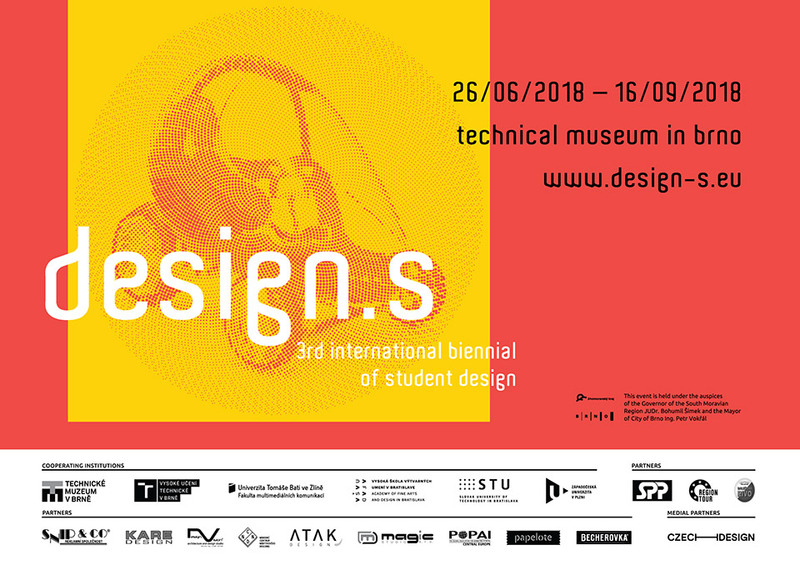 The Technical Museum in Brno invites applications to the 3rd International Biennial of Student Design 2018. The exhibition of student works will be held from 26 June to 16 September 2018 in the Technical Museum in Brno. The aim of the project is to present the best of what has emerged in the field of student design over the last three years across different schools, and at the same time to confront student work from different countries. The biennial is designed for all students of design and related disciplines. Recent graduates can also take part. The only condition is that the work was created during the course of study, however, it must not be older than three years. Selected works will be exhibited at the student design show. The best works will be awarded by an expert jury or business representatives. For additional information, participation rules and application form, see design-s.eu, facebook design-s. For further questions, please write to info@design-s.eu. Registration deadline: March 16, 2018.